New York Gallery: History, Collection Highlights: Modernist Painting and Sculpture, Exhibitions. Museum of Modern Art Building. 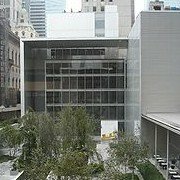 One of the best galleries of contemporary art in the world, New York's Museum of Modern Art (MoMA) is located on 53rd Street, Manhattan, between Fifth and Sixth Avenues. One of three internationally acclaimed art venues in the city - the others being the Samuel R Guggenheim Museum and the Metropolitan Museum of Art - MoMA is considered by curators and historians to have one of the finest collections of modern art in the world. Its permanent collection provides students and visitors with a unique overview of modernism and its evolution since the era of Impressionism.  The Starry Night, by Vincent van Gogh.  The Bather, by Paul Cézanne.  Les Demoiselles d'Avignon, by Pablo Picasso.  Water Lilies triptych, by Claude Monet.  House by the Railroad, by Edward Hopper.  Christina's World, by Andrew Wyeth.  The Persistence of Memory, by Salvador Dali.  Broadway Boogie Woogie, by Piet Mondrian.  One: Number 31, 1950, by Jackson Pollock.  Bed. 1955, by Robert Rauschenberg.  Campbell's Soup Cans, by Andy Warhol. In addition to its collection of some of the greatest 20th century paintings, MoMA's collection includes works of drawing, mixed media, printmaking, architecture and design, illustrated books, fine art photography, film and electronic media, as well as works of sculpture by nearly all the great modern European sculptors. During the late 1920s, three progressive patrons of fine art - Abby Aldrich Rockefeller (wife of John D. Rockefeller Jr.) along with two of her friends, Mrs. Cornelius J. Sullivan, and Miss Lillie P. Bliss - perceived a need for a new type of museum dedicated to fine art of the late-19th and early-20th century. Accordingly, they invited A. Conger Goodyear, a former president of the Albright Art Gallery in Buffalo, New York, to become president of the new Museum of Modern Art. Other members of the team duly included Paul J. Sachs, curator of prints and drawings at the Fogg Art Museum at Harvard University and Alfred H. Barr Jr., who became Museum Director. Under Barr's supervision, the museum's collection rapidly increased from an initial donation of eight prints and one drawing, and opened to the public on November 7, 1929 with a loan exhibition featuring works by Post-Impressionists Van Gogh, Paul Gauguin, Paul Cezanne, and Georges Seurat. The venture met with huge success and over the next decade the Museum was obliged to relocate on three occasions into larger premises, before finally in 1939 settling into the building it now occupies in mid-town Manhattan. (See also: American Architecture 1600-present.) From the outset, the idea was to create a series of separate art departments encompassing architecture, film and photography, as well as the more traditional painting, sculpture, drawings, and prints. Meantime, during the early years of development, MoMA held a number of major art shows, including the Vincent van Gogh exhibition in November 1935, the celebrated Picasso retrospective of 1939-40, which was staged in partnership with the Art Institute of Chicago. The relationship between the museum and the Rockefeller family continued to be close: in 1937, MoMA moved into offices and galleries in the Time & Life Building in the Rockefeller Center. Then, in 1939, the 30-year old Nelson Rockefeller became MoMA's President, overseeing the museum's acquisitions policy and expansion into new headquarters. Nelson's brother, David, took over the presidency when Nelson was elected Governor of New York in 1958. This period witnessed a number of expansions, during the 1950s and 1960s, and in 1984, a major renovation doubled the Museum's gallery space and greatly improved the available facilities. In the early 2000s, the museum underwent the most ambitious renovation in its history, doubling its available display space. Designed by the Japanese architect Yoshio Taniguchi, the western side of the complex, housing The Peggy and David Rockefeller Building, now contains the main display galleries, while The Lewis B and Dorothy Cullman Education and Research Building to the east has been greatly expanded to house a series of classrooms, auditoriums, workshops and studios, as well as the museum's archives and library. Between these two buildings sits the Abby Aldrich Rockefeller Sculpture Garden, with its masterpieces by Auguste Rodin, Constantin Brancusi, Alberto Giacometti and Richard Serra. Although not devoid of controversy, MoMA's recent granite and glass renovation has coincided with a significant rise in the number of visitors to the museum - from roughly 1.5 million to 2.5 million per annum. MoMA's art collection consists of more than 150,000 items - paintings, sculptures, drawings, prints, photographs, architectural models, and design objects - plus about 22,000 films and 4 million film stills. The museum's library and archives contain more than 300,000 books, and periodicals, as well as individual source material on over 70,000 artists, and a host of archival resources on the history of art, including a wide range of information on modern art movements and contemporary art movements. The list of famous artists represented in MoMA's permanent collection reads like an A-Z of Europe's most renowned painters and sculptors. It includes acknowledged masters in all the painting genres, (portaiture, history/narrative painting, landscapes, genre painting and still life, as well as abstract art), including: Alberto Giacometti, Amedeo Modigliani, Andre Derain, Auguste Rodin, Claude Monet, Constantin Brancusi, Edouard Vuillard, Edvard Munch, Ernst Ludwig Kirchner, Fernand Leger, Georges Braque, Georges Seurat, Giorgio de Chirico, Gustav Klimt, Henri Matisse, Henri Rousseau, Joan Miro, Joseph Beuys, Kasimir Malevich, Marc Chagall, Marcel Duchamp, Max Beckmann, Max Ernst, Oskar Kokoschka, Otto Dix, Pablo Picasso, Paul Cezanne, Paul Gauguin, Paul Klee, Piet Mondrian, Rene Magritte, Robert Delaunay, Salvador Dali, Umberto Boccioni, Vasily Kandinsky, and Vincent van Gogh. The museum also holds many influential works of American art by artists including Edward Hopper, Robert Rauschenberg, Andrew Wyeth, Jasper Johns, Arshile Gorky, Jackson Pollock, Barnett Newman, Mark Rothko, Frank Stella, Joseph Cornell, Claes Oldenburg, James Rosenquist, Roy Lichtenstein, Sol LeWitt, Andy Warhol, Bruce Nauman, Jean-Michel Basquiat, Chuck Close, Georgia O'Keeffe, Jeff Koons and Richard Serra, among others. MoMA has a renowned Fine Art Photography collection, assembled over the years by figures like Edward Steichen (1879-1973) and John Szarkowski (1925-2007), as well as an important Department of Film and Video containing prints of many iconic movies, (eg. Citizen Kane), along with a number of contemporary items, including Andy Warhol's eight-hour Empire and Chris Cunningham's music video for Bjork's All Is Full of Love. The museum also has a significant design collection, with works by legendary designers such as the Eameses, Paul Laszlo, Isamu Noguchi, and George Nelson. MoMA hosts an active program of shows presenting a wide range of subject matter - including feminist art - media, and time periods, illustrating recent developments in the visual arts, along with new interpretations of major artists and art movements. As part of its role as an educational institution, MoMA maintains an extensive program of activities designed to enhance the understanding and appreciation of modern art among the the general public. As well as gallery talks, lectures, and symposia, the Museum provides special events for students, teachers, parents, pre-school children, and people with special needs. For information about other exhibitions of avant-garde artworks, please see: Best Contemporary Art Festivals in America and Europe. Here is a list of the main highlights by famous painters represented in the museum's permanent collection. Unless stated, all works are oil on canvas. Ad Reinhardt. Abstract Painting. 1960-61. Alberto Giacometti. City Square. 1948. Bronze. Alberto Giacometti. Man Pointing. 1947. Bronze. Alberto Giacometti. The Palace at 4 a.m. 1932. Wood, glass, wire, and string. Alexander Calder. Black Widow. 1959. Sheet steel. Alighiero e Boetti. Map of the World. 1989. Embroidery on fabric. Amedeo Modigliani. Anna Zborowska. 1917. Ana Mendieta. Nile Born. 1984. Sand and binder on wood. Andrew Wyeth. Christina's World (1948). Tempera on panel. Andy Warhol. Gold Marilyn Monroe. 1962. Silkscreen ink on canvas. Anselm Kiefer. Wooden Room. 1972. Charcoal and oil on burlap. Aristide Maillol. The River. Completed 1943. Lead. Arshile Gorky. Summation. 1947. Pencil, pastel, charcoal on paper. Auguste Rodin. Monument to Balzac. 1898 (bronze cast 1954). Beatriz Milhazes. Succulent Eggplants. 1996. Polymer paint on canvas. Blinky Palermo. Untitled. 1970. Dyed cotton mounted on muslin. Brice Marden. Grove Group I. 1972-73. Oil and wax on canvas. Bruce Nauman. Human/Need/Desire. 1983. Mixed media. Bruce Nauman. Learned Helplessness in Rats. 1988. Mixed media. Cai Guo-Qiang. Borrowing Your Enemy's Arrows. 1998. Mixed media. Carl Andre. 144 Lead Square. 1969. Lead. Charles Ray. Family Romance. 1993. Painted fiberglass and synthetic hair. Chris Burden. Medusa's Head. 1990. Mixed media. Chris Ofili. Prince amongst Thieves. 1999. Mixed media. Claes Oldenburg. Giant Soft Fan. 1966-67. Mixed media. Claude Monet. Water Lilies triptych. Constantin Brancusi. Fish. 1930. Blue-gray marble. David Hammons. High Falutin'. 1990. Mixed media. Diego Rivera. Agrarian Leader Zapata. 1931. Fresco. Donald Judd. Untitled (Stack). 1967. Mixed media. Doris Salcedo. Untitled. 1995. Wood, cement, steel, cloth, and leather. Edouard Vuillard. Interior, Mother and Sister of the Artist. 1893. Edvard Munch. The Storm. 1893. Elizabeth Murray. Dis Pair. 1989-90. Mixed media. Ellsworth Kelly. Brooklyn Bridge VII. 1962. Ernst Ludwig Kirchner. Street, Dresden. Dated 1907. Eva Hesse. Repetition Nineteen III. 1968. Fiberglass and polyester resin. Felix Gonzalez-Torres. "Untitled" (Perfect Lovers). 1991. Clocks, paint on wall. Fernand Leger. Three Women. 1921. Frank Stella. The Marriage of Reason and Squalor, II. 1959. Enamel/canvas. Frida Kahlo. Self-Portrait with Cropped Hair. 1940. Georges Braque. The Large Trees. L'Estaque, 1906-07. Georges-Pierre Seurat. Evening, Honfleur. 1886. Georges-Pierre Seurat. Port-en-Bessin, Entrance to the Harbour. 1888. Georgia O'Keeffe. Lake George Window. 1929. Gerhard Richter. October 18, 1977. 1988. Fifteen paintings. Installation. Giorgio de Chirico. The Song of Love. 1914. Giovanni Anselmo. Torsion. 1968. Cement, leather, and wood. Gordon Matta-Clark. Bingo. 1974. Building fragments. Gustav Klimt. Hope, II. 1907-08. Oil, gold, and platinum on canvas. Gustav Klutsis. Maquette for Radio-Announcer. 1922. Mixed media. Hélio Oiticica. Box Bolide 12, 'archeologic'. 1964-65. Mixed media. Henri Matisse. Goldfish and Palette. 1914. Henri Matisse. The Moroccans. 1915-1916. Henri Matisse. The Red Studio. 1911. Henri Rousseau. The Sleeping Gypsy. 1897. Jackie Winsor. Bound Square. 1972. Wood and twine. Jackson Pollock. One: Number 31, 1950. 1950. Oil and enamel paint. Jackson Pollock. Shimmering Substance. 1946. James Turrell. A Frontal Passage. 1994. Light. Jasper Johns. Flag. 1954. Encaustic, oil, and collage. Jeff Koons. New Shelton Wet/Dry Doubledecker. 1981. Mixed media. Jenny Holzer. Laments (I Want to Live). 1989. Marble. Mixed media. Joan Miro. "Hirondelle Amour". Barcelona, 1934. Joan Miro. Moonbird. 1966. Bronze. Joan Miro. The Birth of the World. Montroig, 1925. Joseph Beuys. Eurasia Siberian Symphony 1963. 1966. Mixed media. Joseph Cornell. Taglioni's Jewel Casket. 1940. Mixed media. Kasimir Malevich. Suprematist Composition: White on White. 1918. Kiki Smith. Untitled. 1987-90. Silvered glass water bottles. Lee Bontecou. Untitled. 1961. Welded steel. Mixed media. Louise Nevelson. Sky Cathedral. 1958. Painted wood. Lyubov Popova. Painterly Architectonic. 1917. Marc Chagall. I and the Village. 1911. Marcel Broodthaers. White Cabinet and White Table. 1965. Mixed media. Marcel Duchamp. Bicycle Wheel. New York 1951. Mark Rothko. No. 3/No. 13. 1949. Martin Puryear. Greed's Trophy. 1984. Mixed media. Matthew Barney. The Cabinet of Baby Fay La Foe. 2000. Mixed media. Max Beckmann. Departure. Frankfurt 1932, Berlin 1933-35. Max Ernst. Two Children Are Threatened by a Nightingale. 1924. Oil on wood . Meret Oppenheim. Object. Paris 1936. Mixed media. Mona Hatoum. Silence. 1994. Glass. Oskar Kokoschka. Hans Tietze and Erica Tietze-Conrat. 1909. Otto Dix. Dr. Mayer-Hermann. Berlin 1926. Oil and tempera on wood. Pablo Picasso. Bather with Beach Ball. Boisgeloup, 1932. Pablo Picasso. Girl before a Mirror. Boisgeloup, 1932. Pablo Picasso. Les Demoiselles d'Avignon. Paris, June-July 1907. Pablo Picasso. The Kitchen. Paris, November 1948. Pablo Picasso. Three Musicians. Fontainebleau, summer 1921. Paul Cezanne. Chateau Noir. 1903-04. Paul Cezanne. Still Life with Fruit Dish. 1879-80. Paul Cezanne. The Bather. c. 1885. Paul Gauguin. The Seed of the Areoi. 1892. Paul Klee. Cat and Bird. 1928. Oil, ink on gessoed canvas, mounted on wood. Philip Guston. Box and Shadow. 1978. Piero Manzoni. Achrome. 1962. Fiberglass on velvet-covered wood. Pierre Bonnard. The Bathroom. 1932. Piet Mondrian. Broadway Boogie Woogie. 1942-43. Rachel Whiteread. Untitled (Paperbacks). 1997. Plaster and steel. Rene Magritte. The False Mirror. 1928. Rene Magritte. The Menaced Assassin. 1927. Richard Hamilton. Pin-up. 1961. Oil, cellulose, and collage on panel. Richard Serra. Torqued Ellipse IV. 1998. Weatherproof steel. Robert Delaunay. Simultaneous Contrasts: Sun and Moon. Paris 1913. Robert Gober. Untitled. 1991. Wood, beeswax, leather, fabric, and human hair. Robert Morris. Untitled. 1969. Felt. Robert Rauschenberg. Bed. 1955. Combine painting: mixed media. Robert Ryman. Pace. 1984. Mixed media. Robert Smithson. Corner Mirror with Coral. 1969. Mirrors and coral. Romare Bearden. Patchwork Quilt. 1970. Mixed media. Roy Lichtenstein. Girl with Ball. 1961. Oil/polymer paint on canvas. Salvador Dali. The Persistence of Memory. 1931. Sam Francis. Towards Disappearance, II. 1958. Scott Burton. Pair of Rock Chairs. 1980-81. Stone (gneiss). Sherrie Levine. Black Newborn. 1994. Cast and sandblasted glass. Sigmar Polke. Watchtower. 1984. Polymer paints and dry pigment on fabric. Sol LeWitt. Serial Project, I (ABCD). 1966. Mixed media. Susan Rothenberg. Axes. 1976. Paint, gesso, charcoal, pencil, on canvas. Umberto Boccioni. Unique Forms of Continuity in Space. 1913. Bronze. Vasily Kandinsky. Panel for Edwin R. Campbell No. 2. 1914. Vasily Kandinsky. Picture with an Archer. 1909. Vincent van Gogh. The Olive Trees. Saint Rémy, June-July 1889. Vincent van Gogh. The Starry Night. Saint Rémy, June 1889. Willem de Kooning. A Tree in Naples. 1960. Willem de Kooning. Woman, I. 1950-52. Wolfgang Laib. The Passageway. 1988. Mixed media.